The Euan MacDonald Centre for research into Motor Neurone Disease was visited by the Princess Royal on Tuesday. 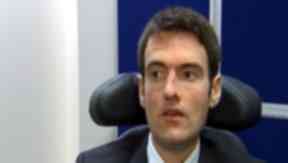 A laboratory is Edinburgh is now a world leader in the research of a muscle wasting condition. Scientists at the Euan MacDonald Centre in Edinburgh were visited by the Princess Royal on Tuesday as she heard about the latest developments. Princess Anne is the Royal Patron of the Motor Neuron Disease Association. The centre was set up in 2007 by Euan MacDonald and his father Donald, who founded the City inn hotel chain. Euan was diagnosed with the disease in 2003 at the age of 29. He said that the work the team does is important for everyone living with the condition. Run by the University of Edinburgh, the centre is part of a groundbreaking collaboration with King’s College London and Columbia University in New York. Scientists from the three centres are using stem cell technology to try and find a way to treat, and hopefully stop the disease. The director of the centre, Professor Siddharthan Chandran said: “We are using stem cell research to try and find out how, why and crucially be able to develop new ways to treat the disease. Around 130 people are diagnosed with the condition every year in Scotland and Donald MacDonald hopes the centre named after his son will be able to help them control the disease.